The CD era from 1983 onwards and particularly over the last ten years has seen a positive explosion of musical riches. Works known only from lists in music dictionaries have become auditory reality. The chance to explore and discover has been extended to anyone for the cost of a CD. This disc marks yet another step forward in documenting what can loosely be called the British musical renaissance. Some may quibble at that word 'British' as Clifford and Gough were Australians (though both spent significant amounts of time in the UK) and Bainton emigrated to Australia in 1934. For those fortunate (as well as tolerant) enough to have discovered the symphonies from private archival or off-air tapes these works will not come as a total revelation. For most people this music will be completely unfamiliar so a few words of orientation and musical triangulation may well help. Everything here is melody-centred. Clifford wrote film music and several lighter orchestral works. Bainton's language is similarly tonal but with lashings of Baxian impressionism. The Bainton Symphony is the second of his three. Its Baxian language is sultry and mixes in a cool Finzi-like pastoralism and perhaps reaches towards Frank Bridge's Summer and two Jefferies Poems. The eruptive flute figure is typical of Bainton. It appears also in the Third Symphony. The language flickers into Debussy (La Mer) territory as well. The Track 4 Maestoso recalls Bax in warlike Rosc-Catha mood as well as cross-referencing to Bax's Fifth Symphony in triumphal mood and this can also be heard in the piu lento of track 10. The hushed rush and shiver of the molto vivace is strikingly memorable and returns for the allegro vivace. The poco piu mosso slides in and out of woodland ecstasy. The rippling woodwind and harp of the adagio might almost have come from the pages of Bax's Spring Fire or Summer Music or Happy Forest. The lento section (track 11) takes much from Bax's Garden of Fand. The tolling molto maestoso might well have been inspired the spine-chilling music Franz Waxman wrote for the animator scene for The Bride of Frankenstein and this returns to close the work with a sense of horror and victory; the last element twisted with an Irish accent. The Gough Serenade is the briefest of opalescent gems. Its easy relaxation coasts along in leafy repose - a chip off George Butterworth and RVW Dives and Lazarus. The Clifford work is simply glorious and the recording conspires to give it the best chance of registering with us catching the throaty woodwind and the abrasive punchy brass. The musical reference points include Walton's First Symphony, the Rootham Symphony (No. 1), a dash of Bliss and Prokofiev. The first movement beats with romantic life darting and vigorous. Handley gives the work an estimable voltaic charge which propels it forward. The Scherzo (II) is similarly restless. The Adagio is the longest movement (over 15 mins) although not for a moment is there a hint of creative sprawl. Concentration is never in doubt and this is well caught in the performance. The finale bustles along with a syncopated confidence that recalls Bliss in the Colour Symphony and Sibelius 2 and 5. The Clifford Symphony can be loosely grouped with dramatic contemporaneous works such as the Arthur Benjamin Symphony and Goossens' No. 1. All the works on these discs are recording premières. They have never been commercially available in any medium. 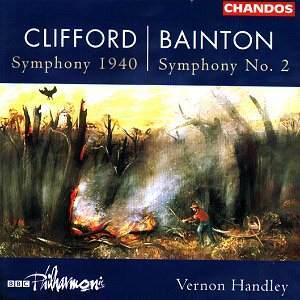 Both the Bainton and the Clifford exist in private recordings but their circulation has been very slender. Now, Chandos, what about turning your attention to Bainton's 'chef d'oeuvre', his Third Symphony. This was recorded commercially during the dawn of the LP preserving a concert performance with the Sydney SO conducted by Sir Bernard Heinze. It is a work with a visionary mien and a power encountered in the sixth symphonies of Vaughan Williams and Bax. It is also a work that demands utter commitment from its conductor and orchestra. I can think of no better match than Handley and the BBCPO. Two previously unrecorded wartime symphonies flanking an even lesser known serenade recorded in excellent sound and in no-compromise performances.